5793 labyrinths found. Showing 4861-4880. Sorted by country, state, city, then zip/postal code. US route 6 east to Main Avenue exit, right on Main then right on Pleasant Drive. St. John's is on right. US route 6 west to Mohawk Avenue, turn left then bear right onto Pleasant Drive. 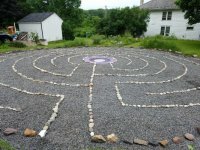 The labyrinth is located on the north side of the Wellness Center at Route 19 and Manifold Road in Washington PA. It is next to the hiking trail behind the Wellness Center. Directions to church available from our web site - labyrinth is located in the Atrium of our Education Building, the Knewstub Building, which is also shown on our website. Available on the 3rd Sunday of each month (November-May) from 3-5pm and during holy week. Check website for details. Dedicated & Consecrated November 2003. 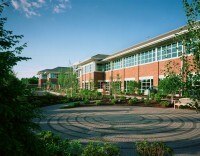 Labyrinth is located across the street from Valley Friends Meeting. Church is 3.2 miles west of the Borough of West Chester, Chester County, PA on state route 162 (Strasburg Rd.) Labyrinth is not visible from the street due to the slope of the property. Labyrinth is to the rear of the property behind the parking lot. Labyrinth has fewer and wider turns than the typical labyrinth in order to accommodate those with mobility impairments. A descriptive marker by the labyrinth is engraved with a classic "finger labyrinth." Enter the campus from Rt. 885. After you reach the first stop sign, continue going straight. Shortly afterwards the road will slightly turn to the right and you will pass the bus stop. At the next stop sign, make a right and go up the short hill, to "G" parking lot, which will be on your left. At the very top of this parking lot will be the walking meditation. The Woodlands is located 2 miles south of the Cranberry, Pa. intersection of the PA Turnpike, I-79 and Rt. 19. Go south on Rt. 19 2.5 miles to Shenot Rd. and turn right. Go 0.3 miles to the Woodlands entrance on the left. Follow driveway to the top of the hill. The labyrinth is in the round building with the sloped roof. Call for specific hours. Generally available weekdays from 9 am - 5 pm and on many Saturdays when retreats are scheduled on campus. Designed for use by individuals with disabilities. A small, four-circuit labyrinth designed for people who use wheelchairs. Located in an ecumenical meditation center on the campus of a year-round program facility for individuals with disabilities, chronic illnesses and special needs. located in the Grayson Arboretum, on the Wilkes University campus off S. Franklin Street alongside South Street, between the Kirby Hall and Alan P. Kirby Center. Please call or email in advance to your visit. Please utilize street parking. Windber Medical Center is located in Somerset County in southwestern Pa. 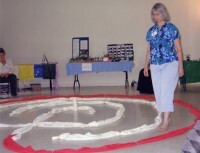 Check hospital website for scheduled Guided Labyrinth Walks and Labyrinth workshops and events. Located 1.5 miles off of route 15, south of Lewisburg, PA.
70* 52' 06.75"W° Lat. ; 40* 53' 52.21"N° Long. From I-83 take the Queen Street Exit (Route 74) South. Follow Queen Street South to Oak Street, turn left onto Oak Street. 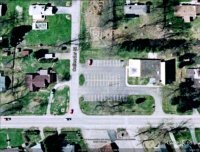 At the stop sign go straight into the York Township Park complex. The Nature Church is located in the second building on the left, near the large playground. 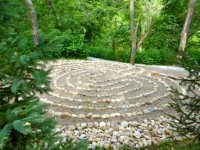 This labyrinth was created by and is owned by Brandy Boswell. 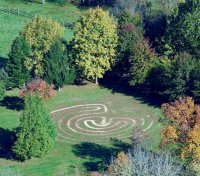 The Labyrinth is available by appointment for private/public workshops or when Brandy is leading a Labyrinth service with the Natrure Church. This Labyrinth is portable and is available for indoor and outdoor events. Please call for more information or visit the Nature Church website for a dated listing of the services. 15 feet max. and adjustable for small areas.